While maintaining a respect for the master techniques, Stephen Bowers' flamboyant and exuberant ceramics combine a classical ceramic heritage with inspiration from indigenous sources and are spiced with dashes of wit. His work is distinguished by intricately painted underglazes which "wear its expertise lightly". 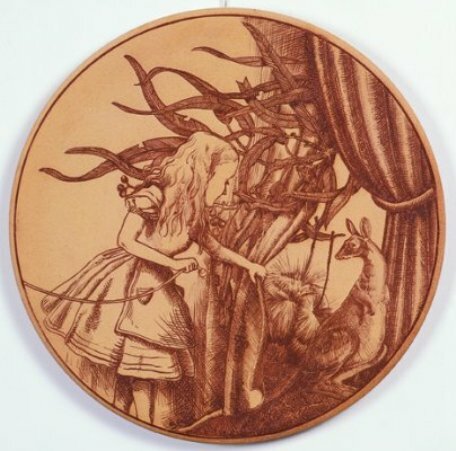 A variety of historical styles form the basis of his decorative explorations, whilst porcelain and textile traditions, copper plate book illustrations, and contemporary material such as comics and magazines provide further inspiration for his designs. As Bowers explains, "I like that rich ornamentation, but I also like defusing it, giving it a slightly funky edge." Close observation of the ornate but seemingly innocent decoration reveals an array of visual and textual puns: The cockatoo a favored image converts the cliché "Polly want a cracker!" to "Cocky want a cuppa! ", whilst the headdress of suplhur crested cockatoos, sublimely suggest the trace of a question mark. The enigmatic question mark, a favored symbol of the artist, reappear often with where blue cockatoos sporting dapper bow ties. Bowers also explores the constructive notions associated with pottery. Vertical lines demarcate decorative borders, but also playfully conspire to create a visual juxtaposition by appearing to impose a hexagonal shape in place of a circular one. While architectural and ceramic traditions have provided rich subject matter for Bowers, he has recently started searching for architectural opportunities for ceramics. It began with his Palaceware series, which consisted of two highly decorated, and large scaled jardinieres, created to his specifications by Mark Heidenreich, which are now in the Powerhouse Museum. Piecemeal 1995, which was one of his entries in the 1995 National Craft Awards, continues this investigation, albeit on a reduced scale. The decorative imitation of marble is maintained with the addition of shards of pottery to the plate design. Included in the cultural and textural quotation are examples of the Chinese Willow pattern and English porcelain from the Industrial Age. On close examination of the painted pottery shards, the viewer is entertained with odd and absurd vignettes, such as the Kangaroo with a drawer for a pouch and road signs attached to Roman columns. Stephen Bowers' pottery with its lustrous surface and epicurian displays elements of pastiche and parody, which combined with his ironic edge, transforms his work into a postmodern ceramic collage. Perhaps more importantly, Bowers' work is a significant contribution to the continued growth of a sophisticated Australian vernacular ceramic tradition. Craftsman House, NSW 1995, p.90. Mansfield, J., Contemporary Ceramic Art in Australia and New Zealand, Craftsman House, NSW 1995, p.90.